Declan Rice challenges Eden Hazard. 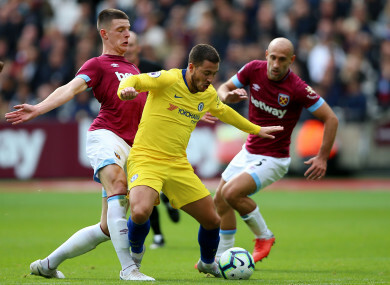 CHELSEA DROPPED THEIR first points of the season on Sunday as West Ham held Maurizio Sarri’s team to a 0-0 draw at the London Stadium. Email “Declan Rice impresses again as Chelsea lose 100% record”. Feedback on “Declan Rice impresses again as Chelsea lose 100% record”.